Fort Smith School District in Arkansas is seeing promising results from its partnership with Lindamood-Bell during the 2017-18 school year. The partnership was initiated to address the needs of struggling readers including those with dyslexia. In an intensive intervention focused on the needs of students previously diagnosed with dyslexia, students receiving Seeing Stars® instruction made significant improvements in reading. Posttest results showed large standard score changes on all measures including a 10-point percentile increase in word recognition and a 12-point increase in word attack. The upswing lands these students closer to normal range (25th-75th percentile) and illustrates the effectiveness of Seeing Stars instruction for children with learning difficulties including dyslexia. The partnership between Fort Smith and Lindamood-Bell was prompted by new dyslexia legislation in Arkansas. Schools across the state are now required to screen all students in kindergarten through second grade for signs of dyslexia. In 2017, school leaders in Fort Smith contracted with Lindamood-Bell for Schools to train teachers in literacy programs and provide support through job-embedded coaching and instructional leadership. Over 300 teachers, including all K-2 classroom teachers, special education teachers, and reading interventionists, attended workshops to learn the steps of the Seeing Stars for Phonological and Orthographic Processing in Reading and Spelling® and Visualizing and Verbalizing for Language Comprehension and Thinking® programs. The programs, written by Lindamood-Bell co-founder Nanci Bell, address the imagery-language foundation that underlies reading, spelling, language comprehension, memory, and critical thinking. By focusing on the imagery-language connection for reading, educators in Fort Smith are addressing a critical missing piece for students with dyslexia. A secondary district goal of preventing literacy deficits in the first place was met through K-2 classroom instruction. Throughout the 2017-18 school year, K-2 classroom teachers supplemented the core Language Arts curriculum with daily Seeing Stars instruction. The district uses the DIBELS assessment to monitor early literacy skills. 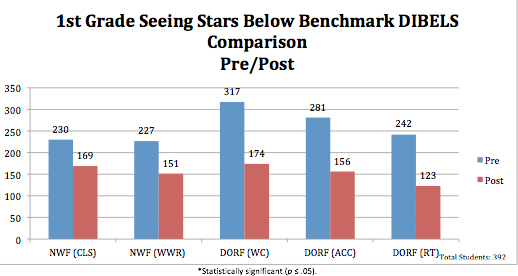 A comparison of DIBELS results at the beginning and end of the school year shows significant changes in conjunction with the use of Seeing Stars. In all areas of reading, far fewer first grade students scored Below Benchmark at the end of the 2017 school year. The partnership between Fort Smith and Lindamood-Bell has been cost-effective for the district’s schools and life-changing for students. “I have seen my students grasp the English language and make sense of why words sound the way they do. I have seen them begin to apply the rules on the Sounds and Symbols chart, and find they are able to decode multi-syllable words,” commented one teacher who attended the program workshops. For more information on Lindamood-Bell’s work with schools and professional development opportunities, click here. To learn more about the Seeing Stars program, click here.